This entry was posted in Feeding With Love, Healthy Eating, Recipes, Starting Solids and tagged dairy free, egg free, wheat free. Bookmark the permalink. Oatmeal is kind of popular in our home, at least for those of us who only eat oats and rice for grains. This particular recipe is really easy to mix up, keeps well so you can make a large batch to eat for a few days, and turns into take along bars if you like. Heat oven to 375 and lightly oil an 9 x 9 or other similarly sized pan. Mix all ingredients in medium bowl until well moistened. 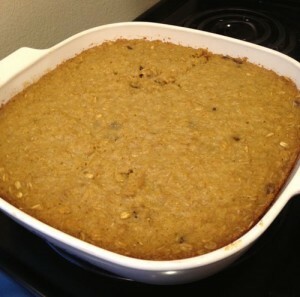 Pour in pan, cover, bake for 35-55 minutes depending on how dense you like your baked oatmeal. Serve warm with a bit of maple syrup, plain, or other favorite topping. Refrigerate the rest and slice into take along bars. This recipe also freezes well. Yum I have to try this! Love this recipe. Am sharing with many friends at the moment. Made it as soon as I saw it! Kids went crazy!! Loved it! It’s a change from the usual breakfasts.